I love this L’Oréal hair care combo! The shampoo and the conditioner are fantastic! 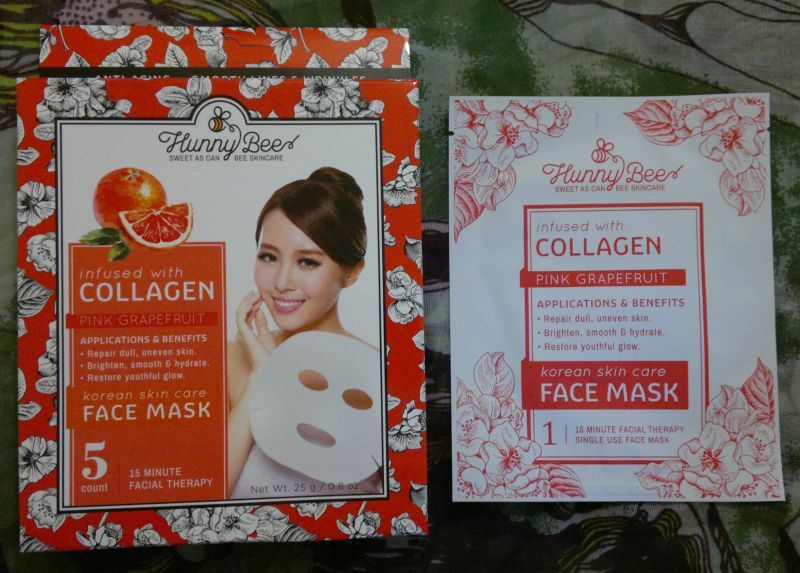 I’m enjoying these Hunny Bee masks very much! 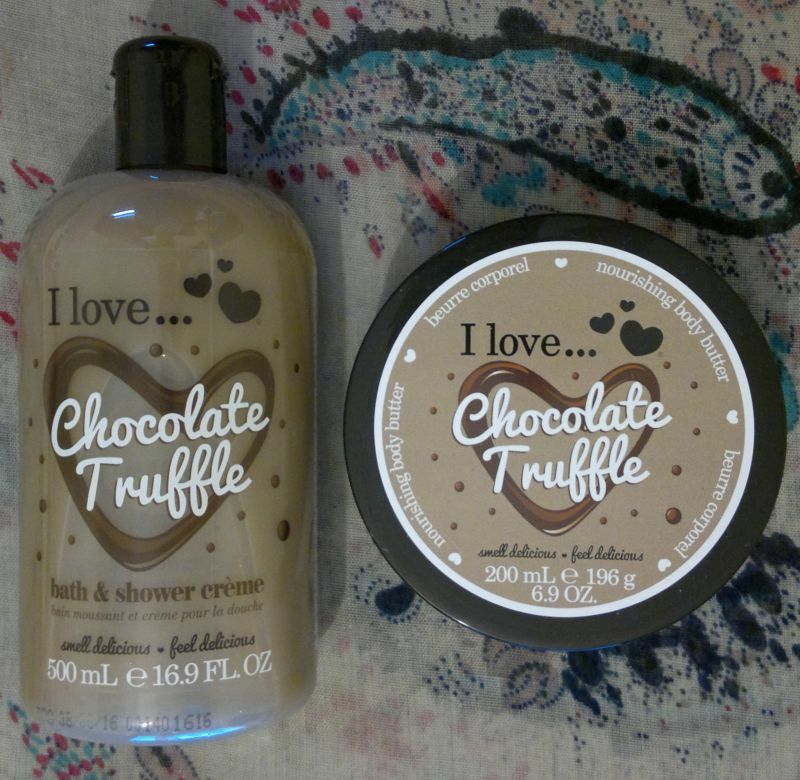 I Love…’s Chocolate Truffle collection is simply sensational! The shower cream, the body butter, the fragrance… these 3 products are just awesome! Now onto the honourable mentions! I think Montagne Jeunesse’s Pumpkin Pie Sauna Mask is great, and I really love Imperial Leather’s Paradise Island Bath Cream! Anyway, for this mani I painted my nails with Rimmel Lycra Pro 425 My Denim (pinkies, index fingers, thumbs), Rimmel 60 Seconds 503 Mind The Gap, Victoria (ring fingers), and Orly Liquid Vinyl (middle fingers). I used Orly Snow Cone (pinkies, index fingers, thumbs), Orly Liquid Vinyl (ring fingers) and Sally Hansen Complete Salon Manicure 310 Gilty Pleasure (middle fingers) as my stamping colours. The stamping plate I used is Pueen’s 55 plate which is part of Pueen’s Buffet Leisure collection. Hi there! 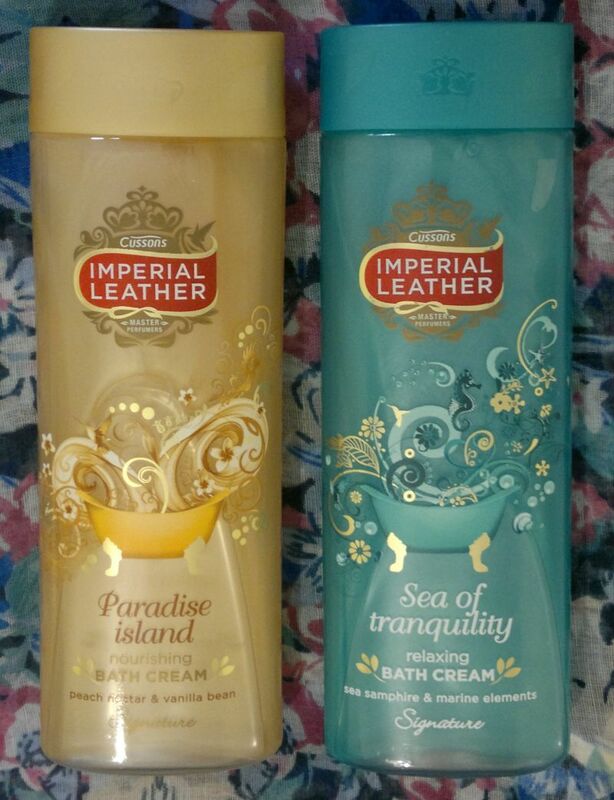 Today’s review is about 2 bath products that I’ve been enjoying lately – Imperial Leather Paradise Island & Sea Of Tranquility. Whilst I generally prefer a shower, nothing beats a hot bath on a cold evening. 🙂 Now, without further ado, onto the reviews! Imperial Leather Paradise Island with peach nectar & vanilla bean smells exactly like peach nectar and vanilla! I love the gorgeous fragrance because it’s beautifully done and because it smells like… summer, sunlight, warmth and pure happiness. Awesome stuff! Imperial Leather Sea Of Tranquility with sea samphire & marine elements is really good too. The fragrance is definitely marine, but fortunately it doesn’t smell like a bath product for men. Very nice! 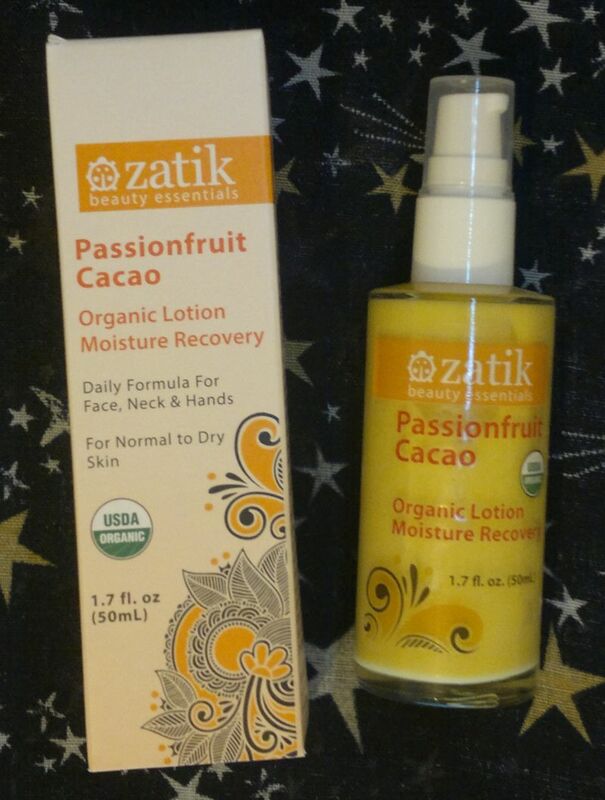 All in all, I’m happy with these products and I’d recommend them – especially Paradise Island! 🙂 I bought these two 500ml bath creams for either 99p or £1 each at one of the bargain stores (I think it was Home Bargains). 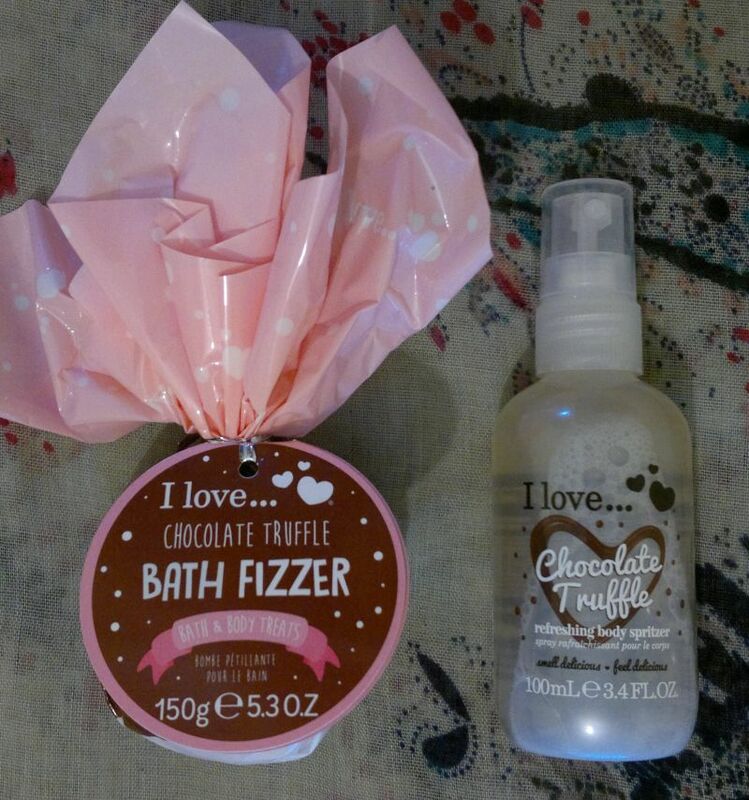 On Monday I reviewed 4 I Love… Chocolate Truffle products. Click here to read the post. On Tuesday I reviewed a moisturiser. Click here to read the post. 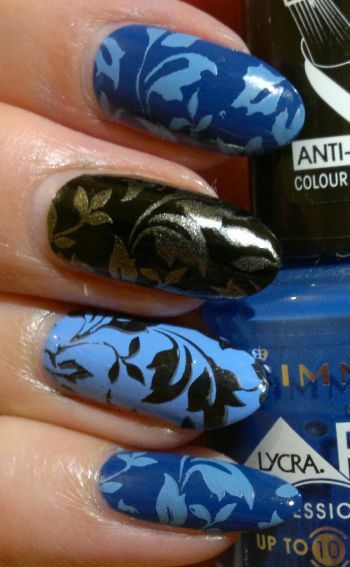 Wednesday’s post was about a mani I did recently. Click here to read the post. Friday’s post was about another great L’Oréal hair care combo. Click here to read the post. 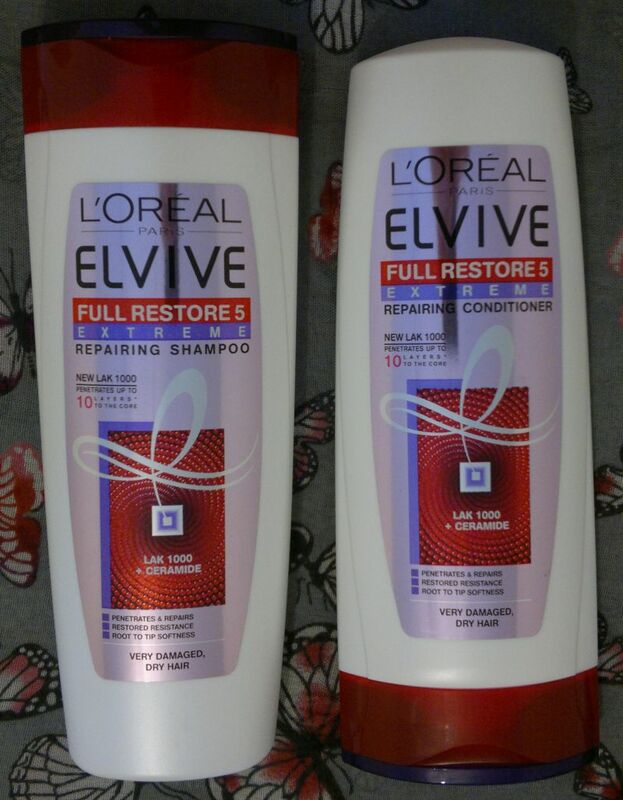 L’Oréal’s Elvive Full Restore 5 Extreme Repairing Shampoo for very damaged and dry hair is very nice. It feels gentle, and I do believe that it has hair repairing powers. This shampoo feels great on my head, and it makes my hair feel super soft. L’Oréal’s Elvive Full Restore 5 Extreme Repairing Conditioner is just as nice. This conditioner is one of the best L’Oréal conditioners. It detangles my hair with ease, and I swear I can feel that this conditioner repairs my hair. It’s really good! Well done, L’Oréal! Hi there! Today’s post is about a mask I picked up a few weeks ago – Montagne Jeunesse Pumpkin Pie Sauna Mask. 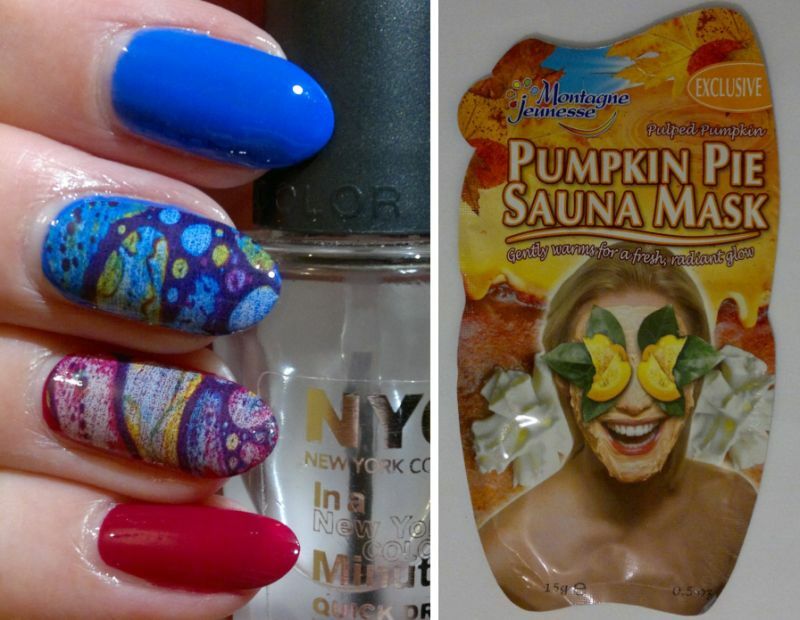 Now that I’ve tried this face mask, I’m happy to report that it’s freakishly amazing! This mask isn’t just a sauna mask, it’s also a scrub mask! 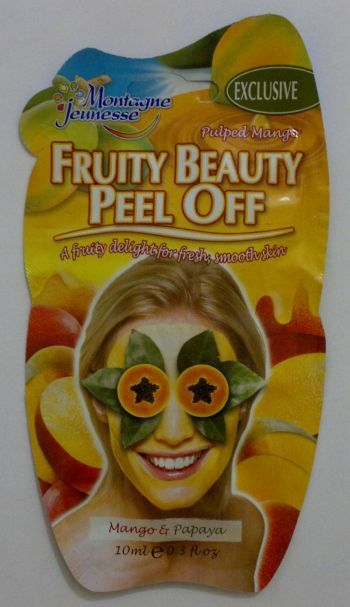 This means that the mask is self-heating, so it opens the pores. And on top of that you can give your face a good scrub for that extra deep clean feel! I’m really glad I bought this mask. And I would recommend it to everyone! I will definitely pick up a few more of these masks! 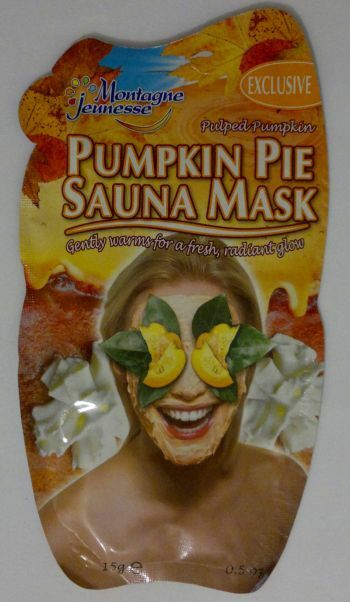 Montagne Jeunesse Pumpkin Pie Sauna Mask is exclusive to Primark where you can pick it up for 90p. This product is also certified cruelty-free!